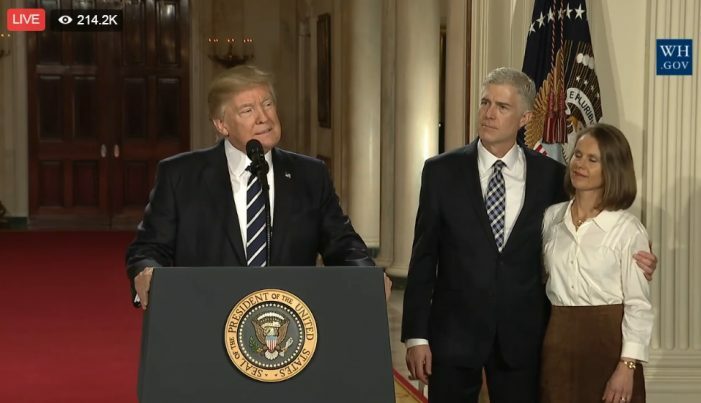 Judge Neil Gorsuch is simply fantastic. It’s no surprise that liberals like Senator Feinstein and Chuck Schumer detest this man with every fiber of their beings. But to understand this vitriol, one has to understand who Judge Gorsuch is, and even more than that, who he isn’t. Hillary Clinton (and most other democrats for that matter) believe that the Supreme Court needs to become an institution that advances progressivism and continuously rejects conservative constitutionalism. They want all of the Justices to take a partisan, one-sided approach to interpreting the law and applying it to modern day politics. The only problem with this strategy is that it’s not how the Supreme Court was originally supposed to operate. It goes without saying that judges must reject partisan politics, and if they have their own opinions on certain issues, those opinions are not supposed to impact decisions that are made. Judges aren’t supposed to say, “I’m a liberal so I’m going to rule as one in every case that comes before me.” Rather, Justices on the Supreme Court need only to adhere to the United States Constitution and the rule of law. In other words, there is no room for Democrats or Republicans in the highest court in the land; there is only room for strict constitutionalists. In a memorial tribute to the late Justice Scalia, Gorsuch said, “Judges should instead strive … to apply the law as it is … not to decide cases based on their own moral convictions or the policy consequences they believe might serve society best.” Indeed, this is the reason why so many conservatives are so fond of Gorsuch, just as they were fond of Scalia – it’s not because these men are Republicans, but because they are constitutionalists. When compared to the intellectual capacity of the liberal democrats questioning him, Gorsuch comes across as an absolute genius. But to say that the Constitution is a “living and breathing document” is an oxymoron, similar to saying “jumbo shrimp” or “deafening silence.” A nation’s constitution, by definition, is the foundation it is built upon. It is the one thing that is supposed to remain the same, even as society changes around it. If the Founding Fathers meant for the Constitution to be changed for political expediency, what would be the point of establishing a Constitution at all?